Every time I have visited France two things have stood out; bread and cheese. The only other city that I have found to even comes close in the category of baked goods is New Orleans and only there in the narrow category of French Bread (again, French roots). I never anticipated that upon moving to Mexico that I would find a bakery that that could compete with the patisseries of Montmartre or the boulangeries of Provence but I was wrong. Incredibly the Panaderia el Horno Mágico in the heart of San Cristóbal seems to have it figured out. 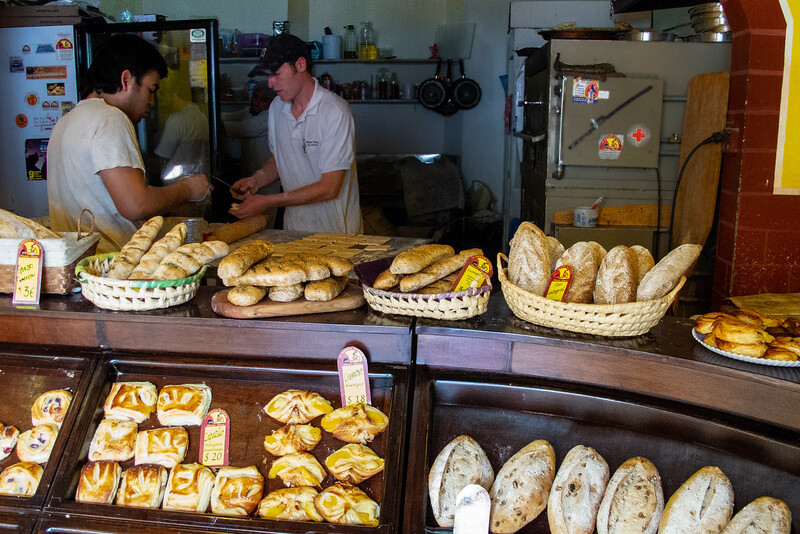 Flaky buttery croissants, hard crusty whole grain loaves and baguettes with that perfectly crisp, crunchy crust and a chewy center makes the Panaderia el Horno Mágico worth seeking out. Sometimes I will walk blocks out of my way just to go by and get a savory ham and cheese filled, warm from the oven, croissant. Other times I will walk blocks out of my way just to avoid the place because I know if I smell the terrific aroma of coming from the ovens I won’t be able to resist trying something new, like the fruit-filled tarts or the breadsticks covered with sharp cheese and browned in the oven; and I don’t need the calories. The place is tiny, everything is take out and often you will have to wait a few minutes as the busy owners divide their time between the ovens and the cash register but it is worth it. The Panaderia el Horno Mágico is to me, one of the best bakeries that I have found outside of France and wouldn’t you know it; it is run by three French expats.